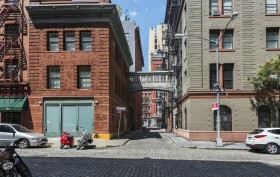 Last month, 6sqft found out about the amazing pair of Tribeca listings that includes one of Manhattan’s last skybridges, and shortly thereafter we were teased with a floorplan of the property, which spans 9 Jay Street and 67 Hudson #3AB. It was said to be a pocket listing, but today the Wall Street Journal noticed the official public listing, which has the three-story townhouse and one-bedroom apartment set at a combined price of $50 million. What’s more surprising than the price being $20 million over initial estimates is the interior photos. Because of the quirky skybridge one would have assumed that the homes were historic, funky, or a combination of both, but they’re in fact completely bare and stark. 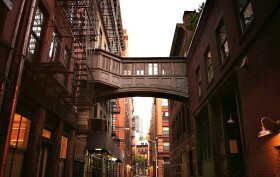 Details were scarce when it was announced last week that one of Manhattan’s last sky bridges was coming to the market. As it turns out, the property, which spans 9 Jay Street and 67 Hudson #3AB, is a pocket listing being marketed by brokers Ryan Serhant and Kaptan Unugur of Nestseekers. 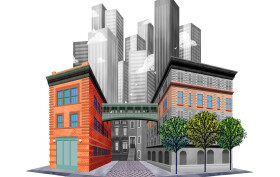 Tribeca Citizen, however, was able to score the floor plan of the massive home, and a pretty nifty rendering offering color-coded a street view of what you’d be buying—if you were to snap up the home, which is going for a reported $30 million. We’ve seen our fair share of quirky listings before, but a personal skybridge included with an apartment is a first. 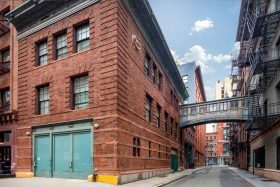 Gothamist reports that, in a very serendipitous twist of fate, the two Tribeca residences (one a townhouse, one an apartment) on either side of the Staple Street skybridge are currently for sale. And according to the Post, the whole package will cost you $30 million.